redlinegti.com • View topic - EGR Vacuum Solenoid - AC idle switch. EGR Vacuum Solenoid - AC idle switch. Post subject: EGR Vacuum Solenoid - AC idle switch. Doing a bit of research its the EGR Vacuum Solenoid valve? Now would this actually change or have anything to do with my aircon idle not working? Anyway any help or advice appreciated, as so far no one can figure out why the rpm doesnt increase when I turn the aircon on. Post subject: Re: EGR Vacuum Solenoid - AC idle switch. Your mechanic has given you the incorrect info. 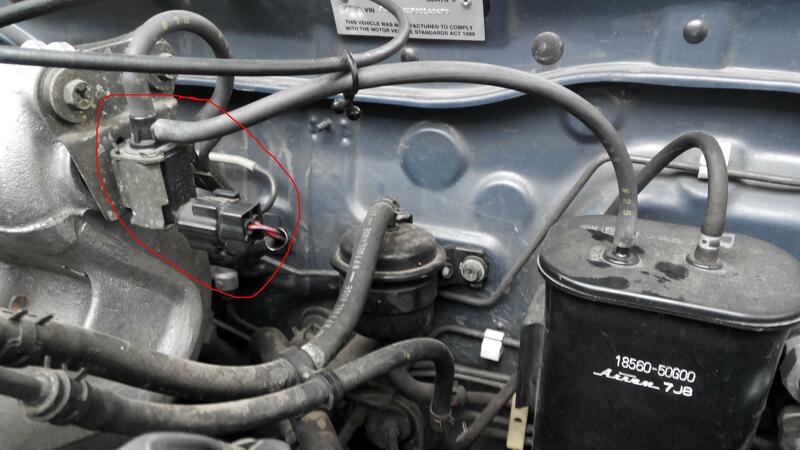 What you are pointing out is the Evap Canister purge valve, nothing to do with the A/C. Here is the check from the Suzuki Manual.